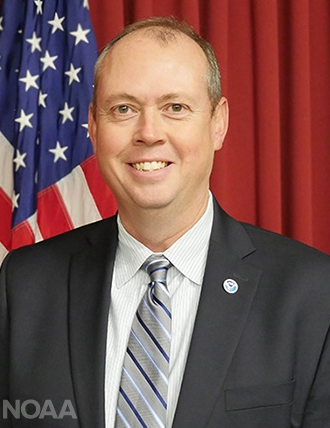 Our keynote speaker for 2019 will be Atmospheric Sciences Alumnus Kenneth Graham, Director of NOAA's National Hurricane Center. Great strides in hurricane modeling has led to much better forecasts. In fact, the track error in 1990 at 24 hours is now equivalent at 3 days in advance. Intensity forecasting continues to improve, but not at the growth rate shown in track. As part of NOAA's Weather-Ready Nation effort, products and services have an increased level of concentration on communicating the impacts of threatening weather, water, and climate events. With Storm Surge historically the number one cause of fatalities resulting from tropical cyclones, the National Hurricane Center implemented the Storm Surge Watch/Warning and inundation graphics to communicate risk and ultimately save lives. Despite all of these improvements, challenges remain with communicating public risk in ways clearly actionable to protect life. The National Hurricane Center continues to involve social and behavior science in aspects of product development. This talk will cover these challenges and share operational examples where communicating atmospheric and hydrologic science in ways that are actionable are a matter of life and death. Ken Graham is the Director of the NOAA National Hurricane Center in Miami, Florida. He received his Bachelor of Science degree at the University of Arizona and earned a Master of Science in Geosciences from Mississippi State University. While in Mississippi, he was a broadcast meteorologist for a CBS affiliate and was an agricultural meteorologist for the Mississippi Network Radio. Ken began his career with NOAA in 1994 as an Intern Forecaster at the National Weather Service (NWS) in New Orleans. His career took him to the agency's Southern Region Headquarters in Fort Worth, Texas, as the Marine and Public Program Manager duing National Weather Service Modernization in the early 1990s. He became the Meteorologist-in-Charge (MIC) at NWS forecast offices in Corpus Christi, Texas, and Birmingham, Alabama, where the office was awarded the Department of Commerce medal each year (2001-2005) for innovative services, such as Instant Messaging with television stations during critical events, such as the Veteran's Day Tornado Outbreak. He has served as Systems Operations Chief at Southern Region Headquarters where he won a Bronze Medal for leading a team to make critical repairs in New Orleans following Hurricane Katrina. He moved to Washington DC to be Chief of Meteorological Services where he worked closely with partners to improve services and briefed Congressional Committees. He then served as the MIC at the NWS New Orleans/Baton Rouge office, during which time the office won the Department of Commerce Bronze medal for innovative services during Hurricane Gustav and Ike, the National Weather Association's Operational Meteorology Award, and was included in the Department of Commerce Gold Medal Award for Decision Support Service that was presented to NOAA for the Deepwater Horizon oil spill. Ken received the National Weather Museum's Weather Hero Award for 2010. Ken has extensive experience working directly with emergency managers during numerous high impact events, including nearly two decades along the U.S. coast. He has deployed to emergency operations centers, provided Impact Based Decision Support Briefings for emergency managers and elected officials, and delivered numerous training sessions and exercises related to tropical weather. Ken was elected a board member of the Louisiana Emergency Preparedness Association, is a member of the National Weather Association and the American Meteorological Association, and is a licensed HAM Radio Operator.